We are two young men wheelchair dependent with severe complex disabilities. We enjoy getting out and about. But we can't go to Birstall and visit places like Ikea and our favourite cinema complex the Showcase. We need a Changing Places, which would give us a hoist, a height adjustable bed, a toilet allowing access from both side as well as room for my chair and two carers. As the founder of Accessible Leeds we need your help to make them aware and make a difference. Please follow this link and sign the petition yourselves! Hello and welcome to Nathan's blog and today I am talking about my Disabled Access Day experience. I went to Leeds City Museum with my friend Colin McDonnell to meet Paul Ralph (pictured centre), founder of Disabled Access Day. We introduced ourselves to him after his very interesting talk on disabled access and why he wanted to come to Leeds. He heard about this website (www.accessibleleeds.com) and he wanted to come to meet me. He followed us round all day in the museum because he wanted to talk to us about our experience of accessibility in Leeds and what we do at AccessibleLeeds. A highlight of the day for me was seeing the efforts some sports are doing to become more disabled friendly and inclusive. When we got there we said we better quickly meet Paul before he opens the day. He talked about what gave him the idea to start Disabled Access Day. It is a very similar story how I found AccessibleLeeds. I loved meeting Paul and the day went smoothly. I can't wait for next year's Disabled Access Day. I hope we will be doing something else for it and I will be doing more blogs. Saturday 12th March is the 2nd Disabled Access Day and I'm going to be at Leeds City Museum. 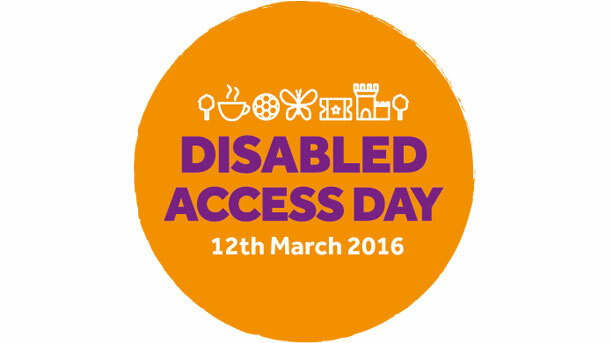 Join me there and look out for my #AccessDay blog and reviews. Final show before the summer break! I am happy to announce that episode 6 of The AccessibleLeeds Show is now online. However, the show will be taking a break for the summer and should return in October. I look forward to presenting with a good sun tan after my holidays! Thank you to everyone for your support and contributions to the show. I hope you will return when we do. The AccessibleLeeds Show 'Episode 5' is now online! That's right! The news desk format of the show is getting more hits on YouTube. I could still do with everyone's help to spread the word though! This month's BIG QUESTION is "What are your thoughts on Leeds schools attitudes to disability and inclusion?". Any answers to that or any other comments, please comment on YouTube, Twitter or Facebook. New Show Format for 'The AccessibleLeeds Show'! I am very happy to announce that 'The AccessibleLeeds Show' is no longer a podcast, but is now a news-cast style show and video based. I hope that this will increase the amount of people connect with AccessibleLeeds and spread awareness! Please see the video below! I am also very happy to announce that I have been awarded a 'Child Friendly Leeds' award for 'Children's Champion' for my work as AccessibleLeeds. I received the award at a fantastic ceremony in January at Leeds City Varieties. It was a brilliant evening and I would like to congratulate the other award winners and nominees! It's my favorite time of the year! Yes, it's Christmas! My third podcast is also the Christmas Special and not only have we added magic bells to the theme tune, but I highlight the wonderful 'Lonely at Christmas' scheme for people in West Yorkshire who may be looking for a spare place at someone's table on Christmas Day. Thank you... and have a very Merry Christmas! I am very happy to announce that there is an online UK accessibility survey available for anyone in the UK with a disability (or a carer in the UK). I was asked by Leeds MP Stuart Andrew to contribute questions for the survey. Whizz-Kidz are also involved to help spread the word. The survey will be available online until the 9th December. Once the results have been collated, if any major issues are found, they should hopefully be raised in Parliament! I have also just finished the 2nd 'AccessibleLeeds Show' podcast to announce the survey. I look forward to hearing any thoughts from you! It was difficult but enjoyable to make and I hope that you all enjoy it too!